This guest post is by Dimitrios Sakellariou, who is currently a student on the Science, Communication and Society MSc programme, which fed into class discussions on the role of museums during the History of Science and Communication core module. “Can a museum be the means for social change?”, I asked myself when I visited the Industrial Gas Museum in Athens. A heterogeneous crowd of families with children, friends and couples of all ages talking and laughing, street vendors selling sweets and balloons in front of the museum, brings the old plant back to life. 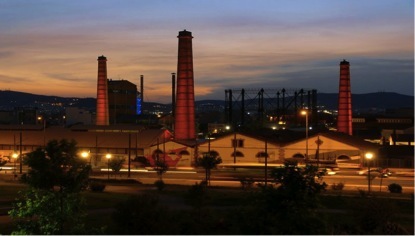 The former Athens Gasworks – which has become the Industrial Gas Museum and Centre of Arts and Culture, known as Technopolis – confirms the museum’s social role. The purpose of my visit was to attend the open science communication event: ‘Exploring the history of science – Exploring the history of humans: An interactive, interdisciplinary approach’. This event consisted of three parts: an interactive visit to the museum; interdisciplinary approaches inspired by the exhibits and the history of the area; and an interactive discussion on the role of science in society. The aim was to facilitate the exchange of knowledge and information among the participants via interactive communication. During the first part of the event, I followed one of the museum guided tours, having the opportunity to explore the old Gasworks’ facilities and to learn about the coal gas production line. The guided tour started from the old plant’s central courtyard, where the workers gathered and weighed the hard coal. The next stop on the historic route of coal gas production line was the purifiers, where hydrogen sulphide was separated from the gas. The last stop was the gasholders, where the gas was stored. The tour introduced me to the history of the old plant and its people. I saw, among other things, parts of the old Gasworks’ equipment and historic objects, such as tools of every-day life, architectural plans and drawings, legal documents, newspaper extracts and old advertising brochures. Additionally, the rich photographic material, the mechanical scale models, selected broadcasts from the archive of Greek public television presenting workers at the old factory and a 3D animation enriched my experience. Another interactive display was a map made by students, providing historical information on the lighting of different neighbourhoods of Athens during the 19th and early 20th centuries. Placing my hand in the industrial furnaces, I heard recorded interviews of the old plant’s workers and local residents, based on oral history projects. This interactive tour offered me an insight into the city’s industrial history and the industrial development of Athens during the 19th and 20th centuries. It provided information about industrial heritage and industrial working conditions. The museum informed all the participants about the story of ideas and practices during the 19th and 20th centuries in Athens – an era of innovation and shared accomplishments. A significant issue in museology is the extent to which the modern museum actively interacts with society. 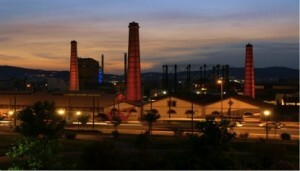 The Industrial Gas Museum in Athens is a place of architectural heritage and industrial archaeology. Museums have often been criticised for being reluctant to change. However, this museum’s mindset is based on interaction and innovation. The second part of the event integrated interactive and diverse approaches to communicating science. A part of the broader factory area (about 30,000 m2) is a venue that hosts cultural events. Following the signs, the participants watched three different interdisciplinary demonstrations. The first was a science art exhibition, which consisted of artworks on renewable energy, made from different materials and based on different techniques. The second was a piece of theatre. Three actors presented short monologues inspired by the daily life of the workers at the Gasworks. The third part of these demonstrations were experiment displays; using basic materials the scientists performed experiments, such as how to write with invisible ink (lemon). One area of the old Gasworks has been converted to a hall where the third part of this event took place. This was an interactive discussion between the audience and scientists regarding the role of science in society during the 19th and the 20th centuries, in terms of what were then cutting edge scientific and technological developments and their role in contemporary society. Visiting a museum sometimes can be an indifferent experience. This event, though, is an example of how a museum can be an interactive living space where visitors can learn how to get involved. The way that this event was organised, the activities presented as well as the open dialogue that we had regarding the role of science in society, offered an insight into how a modern engaging museum can provide a forum for effective public social dialogue. The idea behind this open science communication event was to activate the way that we think of science by emphasising the extent to which science is interwoven with society. Events like this are a stimulus to value museums not only for their exhibited collections but also for their societal role. This kind of interactive event contributes to the ongoing evolution of museums by inspiring us, their visitors, to think, act and be in the service of our society. Science communication, though, should not be limited to a single event but should be a repeated process. Consequently, this was an inspiration to integrate similar science-related activities into my entertainment and learning activities. After all, learning can be fun!